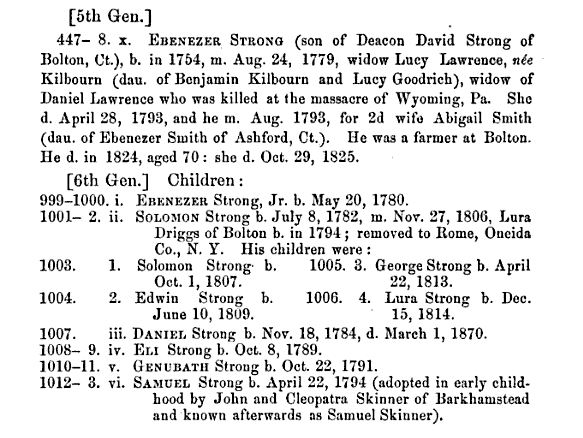 Genubath was the third of six sons born to Ebenezer and Lucy Strong. His brothers were Ebenezer, Solomon, Daniel, Eli, and Samuel. 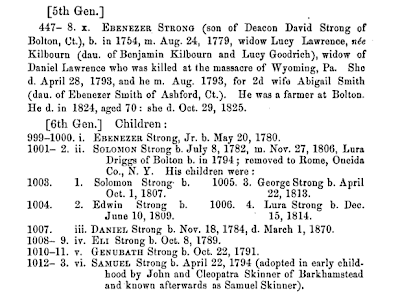 Also of note: the genealogy says that the youngest son, Samuel, was adopted in infancy. I don't know why — his mother was still alive and lived another 30 years after his birth (though she did not have any more children, so perhaps there was some sort of problem). Anyway, his adoptive parents were named John and Cleopatra Skinner. In the Bible, Genubath is an Edomite brought up by an Egyptian queen (1 Kings 11:20). I was doing some research on some of the Mayflower familes for my tree, and there was a family of children who were brought over because their mother had had an affair, so they took her kids and sent them to the Americas. I imagine something like that could be the reason for the adoption in your article.